There's a rather unique tombstone at Girard Cemetery in Erie County, Pennsylvania. It doesn't feature an elaborate shape or carving, nor does its size immediately draw the eye of visitors. In fact, from afar, it looks pretty unassuming---just a normal tombstone. It's only when one gets close enough to read the epitaph that one realizes just how special this tombstone really is. Ellen Shannon was born in Ireland around 1844. As a housewife living in Pennsylvania, she suffered an extremely tragic and quite ironic death at the age of 26. An oil lamp exploded, fatally burning the young woman. 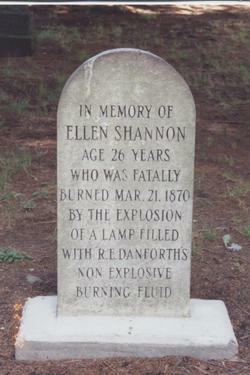 While burns sustained from lamp accidents was a pretty common thing during this time period, the family of Ellen Shannon decided to use her tombstone as a way to point out the ironies in this particular case and warn the public that it could happen to them, too! A product known as R.E. Danforth's non-explosive burning liquid did just what it was marketed NOT to, and the results were deadly. In fact, it wasn't the only time Danforth's product claims failed to deliver. In November of 1872 a twelve year old boy suffered a similar fate trying to light his wood stove. In a time before Consumer Reports, the Better Business Bureau, and the internet, one family took it upon themselves to find a unique way to not only warn others of a dangerous product, but to get in a sweet little jab to the company as well. Over 100 years later, this tombstone still exists to tell the tragic and ironic tale of a young Irish girl's death...a death that should never had happened. Buyer Beware. I stumbled across your page by accident, and I must say, I think your blog is pretty cool! Book-marked it and everything!